A free utility which can quickly paste tet into text editing boxes with a combination of hotkeys. Extremely small, easy to use and for many, a big time saver clipboard program which is worth giving a try! CopyTexty can quickly paste regularly used words and phrases through the combination of hotkeys, a great program when you think of using "canned replies" when replying to emails! 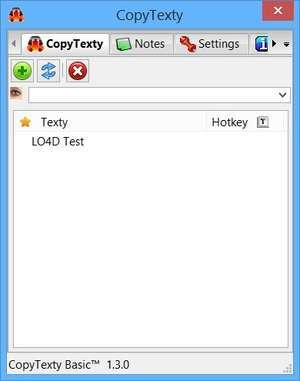 For security reasons, you should also check out the CopyTexty download at LO4D.com which includes virus and malware tests. Additional screenshots of this application download may be available, too.